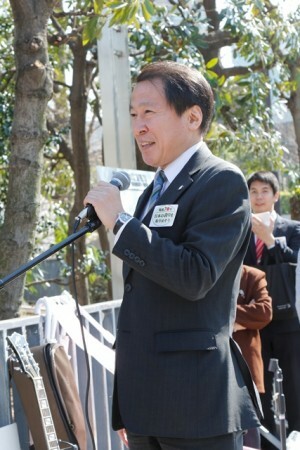 In its protest against China’s attempt to add so-called “Nanking Massacre” and “Comfort Women” to UENSCO’s Memory of the World Register, the Happiness Realization Party submitted a petition, accompanied by 192,036 supporting signatures, to the Prime Minister’s Cabinet Office, urging the Government of Japan to take every measure necessary to prevent their registrations. 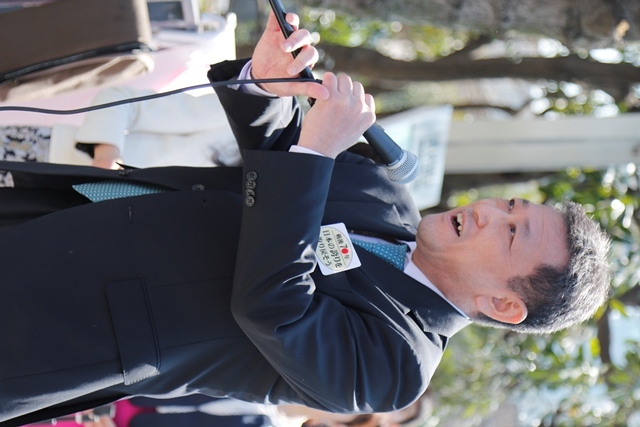 On April 2, 2015, the Happiness Realization Party submitted a petition, accompanied by 192,036 supporting signatures, to the Prime Minister’s Cabinet Office. 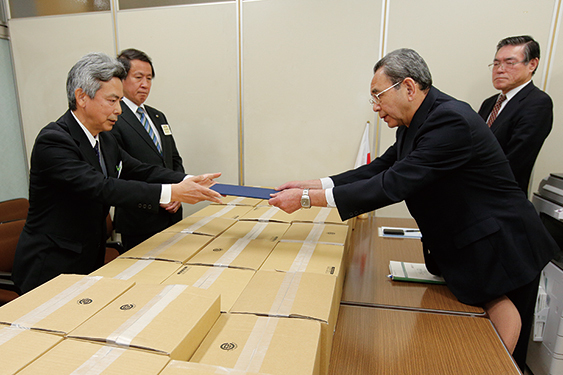 The petition was addressed directly to Prime Minister Shinzo Abe. 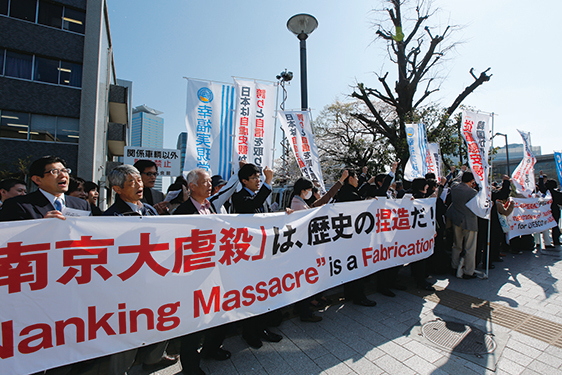 The petition represented a protest by concerned Japanese citizens against China’s attempt to add the so-called “Nanking Massacre” and “Comfort Women” to UENSCO’s Memory of the World Register, and urged Prime Minister Abe to take every measure necessary for the Government of Japan to ensure that these fabricated historical narratives not be registered. Under a clear spring sky, approximately 200 supporters gathered on a public street in front of the Prime Minister’s official residence, petitioning the Government to take every measure necessary to have China’s attempt dismissed. 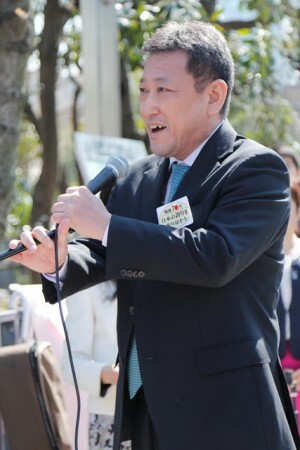 At the rally which took place in front of the Prime Minister’s official residence, our Party leader Ryoko Shaku gave a speech on behalf of concerned Japanese citizens: “I will not hesitate to express my indignation toward the Chinese government’s maneuver to have fabricated history registered as shared memory of mankind, sponsored by UNESCO. 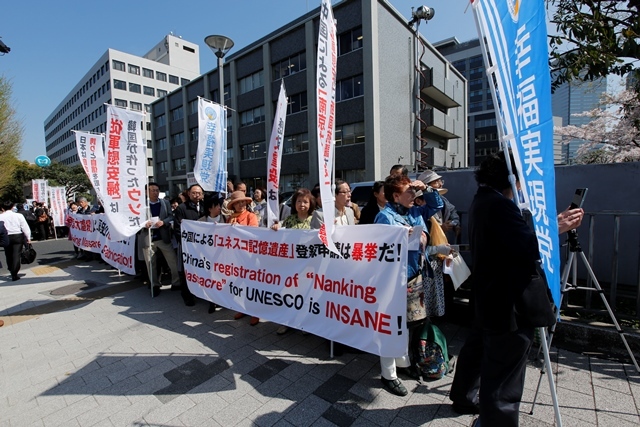 The so-called “Nanking Massacre” and “comfort women who were forcibly taken along with the Japanese troops” are utter nonsense. We must fight together to disseminate a correct understanding of history to the international community and restore the honor of Japan to its proper place,” stated Shaku. Shaku was followed by Kazuhiro TakeGawa, Chief Officer for International Public Relations of Happy Science International Headquarters. TakeGawa hand delivered a petition accompanied by supporting signatures to the UNESCO Headquarters in France. The petition protested against China’s nominations of the two false historical narratives. 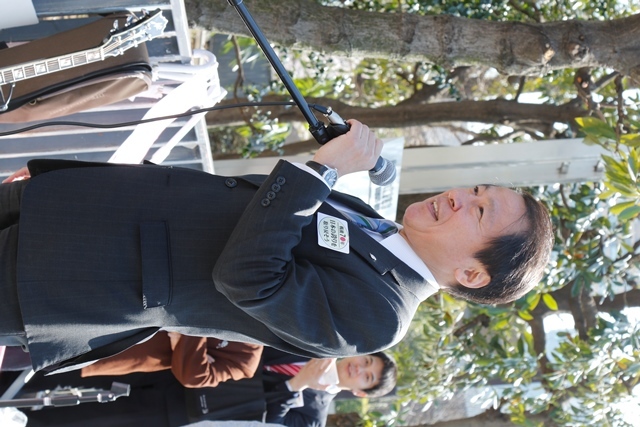 TakeGawa strongly affirmed that the so-called “Nanking Massacre” and “Comfort Women” were narratives fabricated on the occasion of the infamous Tokyo Trials. “The Chinese government’s attempt to have them registered as UNESCO’s Memory of the World therefore should merit no serious consideration,” appealed TakeGawa to the enthusiastic audience. The speeches were followed by an adoption of a petition entitled “A petition to protest against China’s nomination of the so-called “Nanking Massacre” and “Comfort Women” as candidates for UNESCO’s Memory of the World Register, and urge the Government of Japan to take every measure necessary to ensure China’s attempt be dismissed.” The petition was then submitted to the Prime Minister’s Cabinet Office by the hands of Fumiyasu Kato, Secretary-General of the Happiness Realization Party, and Motoyo Manabe, a member of the Party’s election committee in the eastern part of Chiba Prefecture. 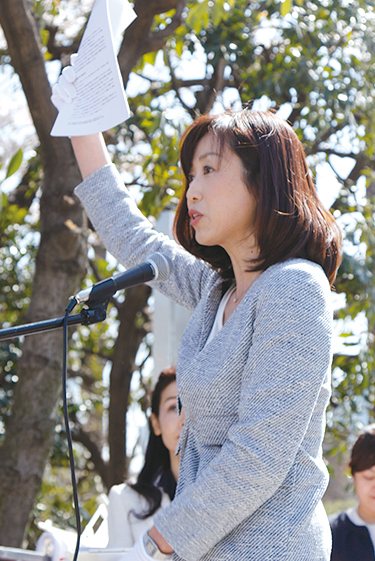 While the petition was being handed to the Prime Minister’s Cabinet Office, Tokumm, the Party’s Chief Officer for its Youth Division, helped liven up the rally by singing songs including “Requiem: To My Grandfather.” Mina Wada of the HRP also gave a speech, urging the Government of Japan to redress the misinformation and animosity toward local residents of Japanese descent which has spread in the United States, following the erections of so-called “comfort woman” statutes in some states. Many appeals of the slogans in chorus enlivened the rally. The rally was concluded when Kato made a report to the eager supporters that the petition had been successfully submitted to the Prime Minister’s Cabinet Office.